We are continuing to adjust to our new life here in Nicaragua, and overall everyone is doing well. We are very grateful for our community back home, thank you for your prayers and support. Many have asked how the kids are doing in their new school. Here is a photo from their first day of school. 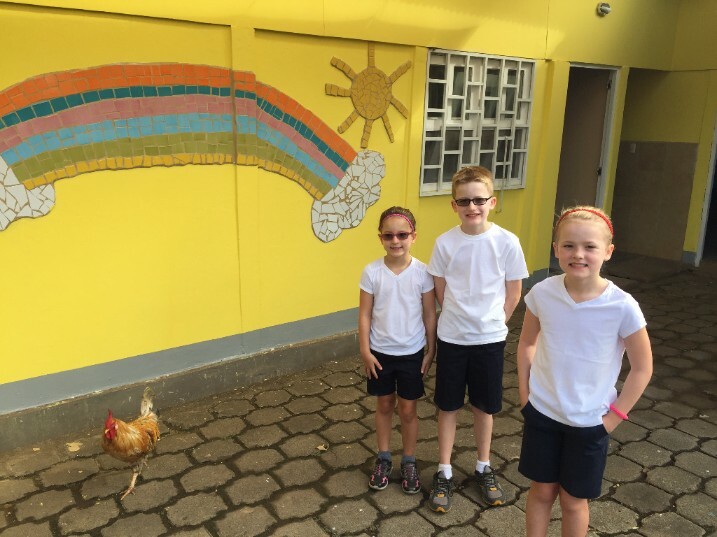 They were excited to find out that the school has its own rooster running around! They are adjusting well, and beginning to learn some Spanish. We are working to identify communities around Granada that are in greatest need in which we can begin to build relationships with the local people. 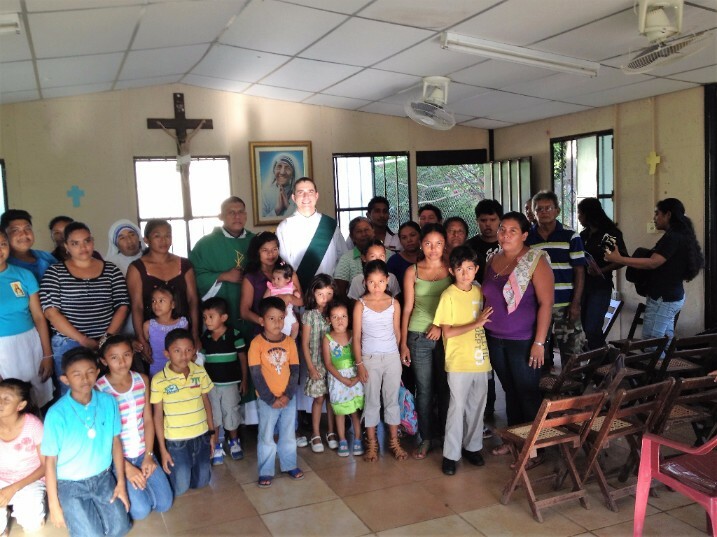 On Sunday, Pat traveled out to one of these communities with a local priest. This particular community has a chapel dedicated to Mother Teresa of Calcutta, who will be canonized a saint this upcoming Sunday. One of the Sisters of Charity (the religious order founded by Mother Teresa) was there with us. Her name is Sister Esperanza ("Hope"). She exemplifies the Esperanza that we as a family desire to share with those we came to serve in Nicaragua. This particular community has to walk or ride a bicycle or horse into town to retrieve water. They also lack access to primary medical care in their community. Yet, they were very gracious in welcoming Pat into their community. Katy and the kids had hoped to visit the community as well, but the vehicle donated by many of you is still awaiting sail in Miami :) As regular vehicles cannot reach this community, Pat rode along on the back of an all-terrain motorcyle driven by the priest. It was a sporting ride, at one point we encountered a group of about 20 bulls, and Pat had to be careful lean in as to not get clipped by a passing horn as we zipped by! In central Granada, there are many child beggars. They hand out palm branches folded into the shapes of flowers "for free." However, if you accept their "gift", they then demand payment for it. Our son, Ben, noticed that many of these children on the streets walk around with a plastic soda bottle tucked inside their shirt. They continually duck their head inside the neck of their shirt to sniff the glue mixture they have inside the soda bottle. Many well-meaning folks give these children money, which is then used to mix up the next batch of glue. Living around those who suffer the effects of poverty does challenge us all each day as to how we are called to respond. As a family, we are committed first to be here as learners and servants, resisting the urge to offer quick solutions to the myriad of problems that exist. 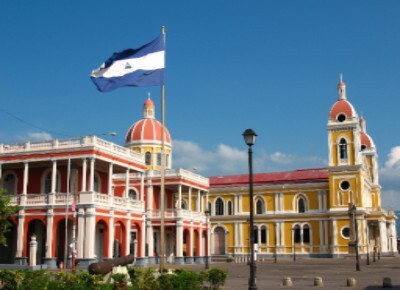 But, over time we do pray that we will build relationships and identify solutions in partnership with our local Nicaraguan friends, that will help to alleviate suffering and advance God&apos;s kingdom on earth as it is in heaven.